Not trying to pry or anything, but you have you by any chance made any revisions to 5-4? The one you titled "Moving Bridges." No offense intended to you, but I personally thought that level was far too difficult and tricky for my liking, perhaps even borderline kaizo. Just thought I'd ask. Not trying to pry or anything, but you by any chance make any revisions to 5-4? The one you titled "Moving Bridges." 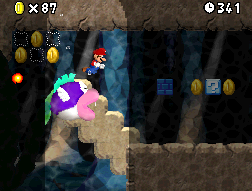 No offense intended to you, but I personally thought that level was far too difficult and tricky for my liking, perhaps even borderline kaizo. Just thought I'd ask. 5-4 will be much easier! I actually added the world progression thing worked out by Sharks and skawo. So now this hack also follows the sequential logic. Sorry for asking, but I never read their posts containing the information and I don't know where to find them. I just wanted to know what "world progression thing" are you talking about? Did it have anything to do with the cannon in world 1? 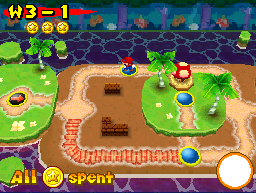 If you finish world 3 you'll get to world 4 instead of world 5 like normally. 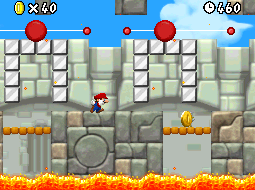 If you finish world 6 you'll get to world 7 instead of world 8 like normally. Oh, OK. I get it now. So basically it is just like the way it was in New Super Mario Bros. Wii, with the 8 worlds all being played in numerical order, without any "secret" worlds. I look forward to trying out version 2.0 of The New Worlds! Hello Arceus, I hope you do not mind the double post, but it is me again. I just thought I wanted to mention that I just completed Super Mario Bros. The New Worlds a short time before posting this reply, and as such I thought I would now give you a summary of my overall thoughts on this hack. I'll post my review below later on. A new version with improved levels coming soon, eh? I look forward to it, since I've kinda stopped playing the current version for some reason, probably its schizophrenic difficulty. I think 5-4 is actually where I stopped. V 2.0 is actually a lot easier than the actual 1.0 version. That's good, because if I were to be honest I would say that a few other levels had what I considered to be excessive difficulty in some sections. 8-8, The Ultimate Fire Challenge, had some parts where I found I could literally not squeeze through without getting hurt, mainly because of how tight some of the spaces were. I can post a screen later on for you, Arceus. The first one was not so bad, but the second one was a pain because of the spike ball. And of course, both of them had the Fire Chomp to factor in. Great to see! I really enjoyed the first version of your hack, and have been eagerly anticipating release 2.0, so I will download and play this new version as soon as I possibly can! and then does not allow me to patch. I have also had this problem before with other games. Any ideas? Meanwhile, I will search for a solution myself. Never mind, I tried what you suggested and it worked. Thank you, Arceus! Did you take a clean ROM which you never opened in any editor? Come to think of it, I'm not sure whether or not the source ROM file i tried using was completely clean or not. I will try acquiring a fresh ROM and patching again. Tell me, though, does the hack need to patched to any specific region/revision game ROM? Or should that not matter? E: It worked! Thank you! Thanks for telling me that! I uploaded a new patch which fixes this thing. Thanks for the quick reply+fix! I'll post here again if I encounter any other bugs. 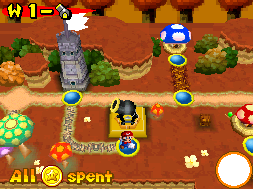 I think you already know this but the last part of '4-Tower: Complex Chain Tower' is very very very lagged. I hope you'll fix this bugs (except the infinite lives one, I found it very useful!) and thanks for that great hack!